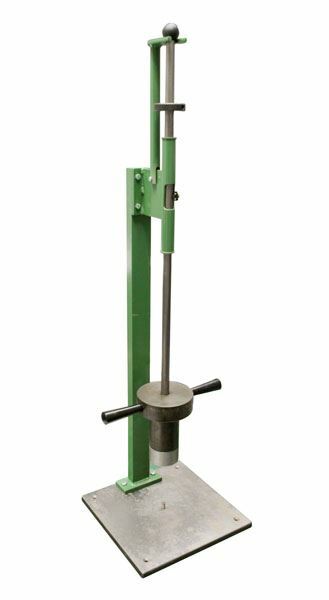 The HM-228 Dropping-Weight Compactor is used with Soil-Cement Molds for sample preparation of soil-cement compressive strength specimens. A 15lb (6.8kg) falling weight on a 3/4in (19mm) shaft guide strikes the top piston of the mold set for dynamic consolidation of the specimen. The Compactor base features a locating pin, assuring precise centering of the Test Mold Set. Drop height is controlled by a clip on the compactor shaft guide.